OpenVPN client option offers best speed and security with a VPN. When you pick Le VPN as your VPN service provider, you have the option of selecting from different VPN protocols. These protocols are Point-to-point tunneling protocol (PPTP), Layer 2 Tunneling Protocol (L2TP), OpenVPN client option, and HybridVPN. 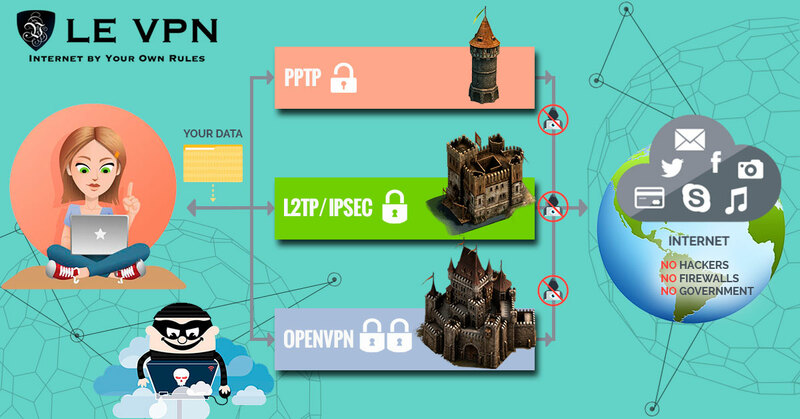 OpenVPN is an open source VPN protocol that uses a Secure Socket Layer (SSL) to create an authenticated, encrypted connection to the Internet. However, nowadays we spend most of our time online. We are constantly using the internet on our phones and computers. And we have come across the term IP address more than once. So, the question may arise, “what is my private IP”? In the section below, we will cover everything that you need to know about IP address; what it is, how it works, and how you can look up your IP address. The information technology or IT is a dynamic field, which is complex and confusing. This is a unique numerical identity for each system. The IP address can help identify the location, from where you are accessing the internet. And accordingly, you are granted or denied access to certain websites. Le VPN helps you to overcome such IP restrictions. IP stands for internet protocol. This is the unique address which is the main point for the online activity that you carry out. This is unique to the device that you are using. For instance, your PC or laptop will have a unique IP address. Look at it this way. Your home has a geographical address that is unique to you, right? This IP address is a lot like your identity and is useful to track you. A virtual private network or VPN is one that masks your IP address by routing off your services to a different geographical location. An OpenVPN client option is one that helps you access websites that were inaccessible previously, mainly due to geo-restrictions. What it does is sends the request from a different service provider, thus concealing your IP address. Your IP address then becomes that of the location from where the request was sent. Thus, if you were looking for a way to bypass all these geo restrictions, Le VPN’s OpenVPN client protocol is one of the solutions. When you are doing something online, you simply switch on the internet connection and you are connected. Simple, right? Wrong. You are accessing the internet indirectly. When you are connected, your service provider sends out a request to the correct destination. That destination then accepts the request and finally grants permission for connection. All this happens because of the IP address. The connection is established based on the IP address. Through the IP address, you connect to a network that connects to the internet. Then, you get permission to access the World Wide Web. Wherever you are. And whichever website is inaccessible, you can always overcome the geo-restriction and censorship with Le VPN. So, opt for Le VPN and enjoy the online security, privacy, and anonymity. That too at great cost. Now, you can subscribe for 2-years of Le VPN service at $69.60.